It was once again time to go through the pantry and check all the expiration dates, resulting in a number of Bob’s Red Mill grains that I need to use up pretty soon. White rice flour, spelt berries, semolina flour, wheat germ and corn grits. Don’t you just love Bob’s Red Mill products? I decided to start with the corn grits. It wasn’t too hard to figure out what to make, I mean, if you say grits, don’t you automatically say ‘shrimp and’ right along with it? While shrimp and grits is the state dish for several Southern states, I had never eaten it, so I decided to remedy that forthwith. 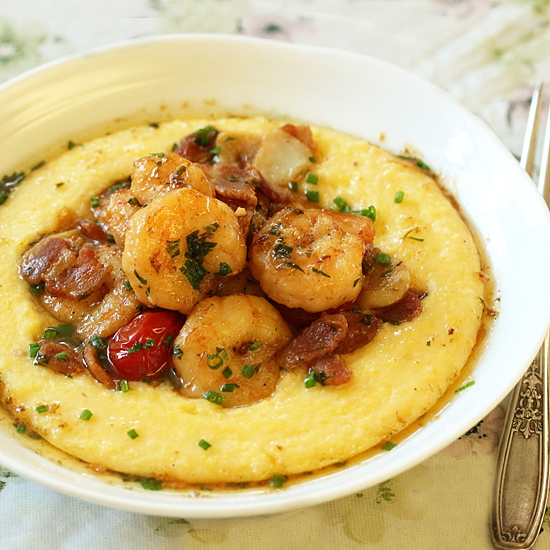 I really love the bacon-y, garlic-y, lemon-y sauce that goes with the shrimp over the cheddar parmesan grits. I added my own touch with the grape tomatoes and was quite happy with that little acid note, along with a garnish of Italian parsley and chives. Perfect. 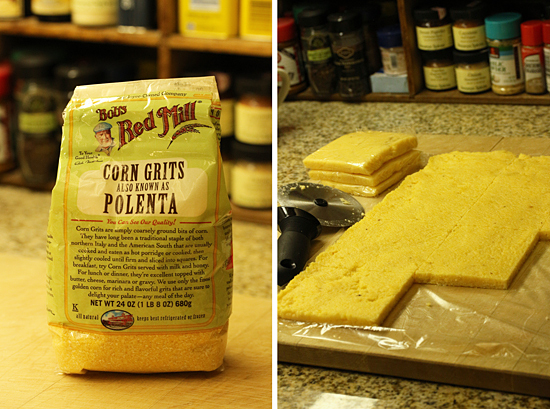 My first experience with cooked ground corn was in the form of polenta when I was doing my culinary school cooking internship at Campanile way back in 1996. On a Saturday when polenta was on the menu, a big vat of it was made. And since I was the absolute low man on the totem pole in the kitchen, guess who got to stand at the hot stove and stir that stock pot full of polenta for about an hour. I was instructed by Chef Mark Peel personally to never stop the stirring motion and running the flat-edged long wooden spoon over the bottom of the pot. 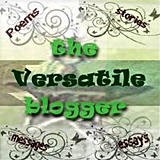 So I persevered, sweated, my arms aching, stirring back and forth, back and forth, until it was finally finished. Ugh. Fortunately for you, in my version, you can stir intermittently. You’ll be fine. I like to make more that I will use on the day, so I can pour what’s leftover on a plastic-lined sheet pan, let it set and cut it into squares that I can freeze. Those yellow squares are so good sautéd in a little butter and topped with your favorite goodies, like tomato pasta sauce with fried Italian sausage or a fried egg. You know how much I love food I can freeze and heat up when the whim strikes me. This is one of my favorites. 1. In a heavy bottomed sauce pan, bring chicken broth, milk and butter to boil. Slowly whisk in grits a little at a time. Reduce heat to very low and simmer for 40 minutes to 1 hour, frequently stirring and scraping bottom of pot, until soft and creamy. 2. Using a large spoon, stir in cheddar and parmesan. Cover and hold until service. 1. In a large sauté pan over medium heat, fry bacon pieces until brown and mostly crisp. Remove to a plate as pieces are done. 2. Add butter and garlic slices to pan. When butter is sizzling, add shrimp and tomatoes. Cook shrimp until pink on one side, turn and finish cooking. Remove to plate. 3. While shrimp is cooking, remove garlic slices to plate when they are starting to be golden. 4. When tomatoes begin to shrivel and split, remove to plate. 5. Add chicken broth to pan and loosen all browned bits from bottom. Pour broth through a fine mesh strainer into a medium bowl. Discard brown bits. 6. Return sauce to pan and add shrimp, tomatoes, garlic and bacon. Add parsley, lemon juice, Tabasco and Worcestershire. Cook until shrimp is heated through. 7. Stir grits with a large spoon until creamy. Place desired amount of grits on plate or flat bowl. Make a well in the center and fill with shrimp mixture. Garnish with sliced green onions or chives. Note: To freeze leftover grits, cover a sheet pan with plastic wrap. Pour grits on wrap and smooth with offset spatula to about ¾ inch thick. Let stand until cool. 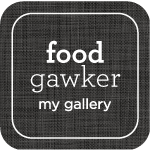 Pull plastic with grits onto cutting board, and with a pizza cutter, cut into about 4×4” squares. Wrap each square in plastic wrap and place in large ziplock bag. Freeze. Reheat on grill pan or sauté pan in a little butter. Cut each square into two triangles if desired. No need to defrost. Forget pilates. You should make a workout video, “Polenta!” And your pupils will have a dish that looks as fabulous as their buff biceps. YUM! 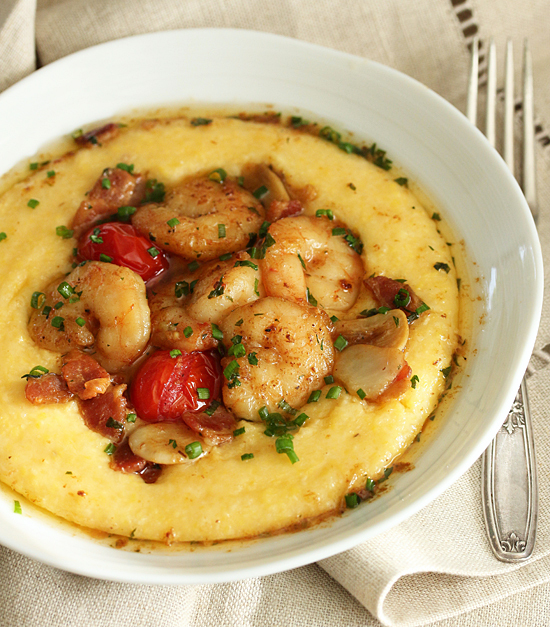 You can’t go wrong with shrimp and grits! And I thought my shrimp and grits recipe was good. Wow! This one is a winner. We go for cream+stock in our grits but that cheese has me thinking I need to add some of that too. Thanks for this one! Absolutely love this recipe. It was a big hit for dinner. DELICIOUS!! !